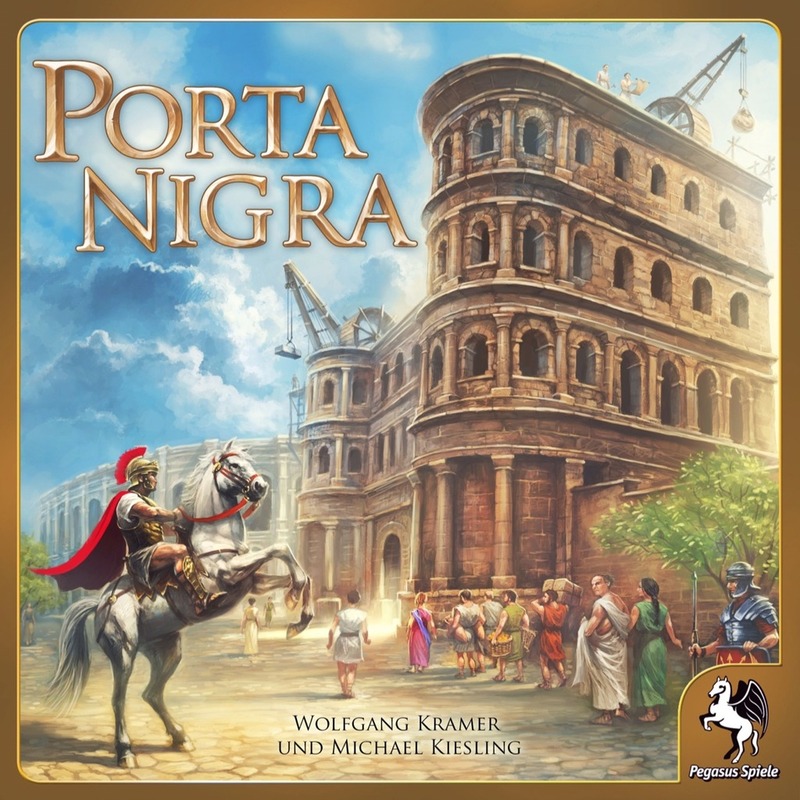 New Jersey, USA – June 3, 2015–Stronghold Games is proud to announce the publication of Porta Nigra, a game designed by the renowned game design team of Wolfgang Kramer and Michael Kiesling, and co-published with Eggert-spiele. Porta Nigra (or black gate) is a large Roman city gate, located in Trier, Germany, and dating back to the 2nd century. The game is set in that place and time with the players taking on the roles of Roman architects working on the city gate of Porta Nigra. In Porta Nigra, 2 to 4 players each command a master builder, who moves around a circular track on the game board, enabling players to buy or build only where this master builder is located. Moving the master builder to farther locations along the track is expensive, so players must plan their movements and builds carefully. The number and type of actions that players may perform on their turn is determined from cards that each player has in their personal draw deck. The buildings in Porta Nigra are erected physically on the game board at the various locations in the city. This is accomplished with 3-D plastic building pieces, which gives Porta Nigra a beautiful and compelling look on the table. Stronghold Games will release Porta Nigra as the first game in its new “Great Designer Series”, which will highlight games from the best game designers in the world. Porta Nigra is designed by the renowned game design team of Wolfgang Kramer and Michael Kiesling. Kramer and Kiesling have previously teamed to design the highly rated games Tikal, Torres, Maharaja, Coal Baron, Palaces of Cararra, and many others. Porta Nigra features the gorgeous artwork of the great artist Michael Menzel, whose work has been featured in many games such as Stone Age, Shogun, Bruges, Rococo, Legends of Andor, and many others. The release of Porta Nigra strengthens the commitment of Stronghold Games to partner with publishers globally, bringing their great games to North America and the rest of the world, as well as to continue to publish great euro-game designs. Porta Nigra follows the success of two smash-hit 2014 euro-games from Stronghold Games, Panamax and Kanban: Automotive Revolution. Stronghold Games recently announced The Golden Ages, a euro-style civilization building game, to be released later this year. Stronghold Games will print Porta Nigra at Ludofact Germany, the leading printer of hobby games in the world. Porta Nigra has a tentative release date of November 2015. The MSRP has been tentatively set at $69.95. Stronghold Games will debut this game at the Essen Spiel in Germany in October 2015.